Authorities have a duty to ensure that Traffic Orders are clearly communicated to all road users through prescribed or authorised signs and street markings. 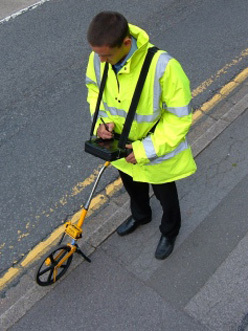 We can help by carrying out a review to ensure that Traffic Orders are accurately reflected by signs and street markings and that these are consistent with the Regulations and Guidance governing their design and situation on street. Reviews also identify signs and markings maintenance issues, such as wear and tear, damage, vandalism or loss. Our careful, methodical work ensures that the start and end points of restrictions, as well as the signs related to them, are reflected on ParkMap with a high degree of accuracy. Discrepancies can be included on the system and will be referred to you for the actions required to rectify. A Traffic Order review can be used as a means of establishing the exact details of all Traffic Order measures represented on street. This can be a useful approach for those authorities interested in moving to map-based Traffic Orders as the map will accurately reflect on-street restrictions. Our team have been providing Traffic Order reviews since shortly after Decriminalised Parking Enforcement was introduced in London. If you require a Traffic Order review for any reason please do not hesitate to contact us for an obligation-free discussion of your requirements.